We pay TOP DOLLAR for your Unwanted Cars! Car removal Sydney is an expert in buying all makes and models of cars, no matter what their age or condition, running or not. We can come to your place, pay you the exact quoted amount (there will be no surprises!!) and will tow your car away in minutes. We also complete all the paperwork so no hassles for you at all. Interested? See for yourself, how easy it is to obtain an instant quote up to $7000 for your unwanted car in Sydney. Our specialty is that we can be at your place as fast as this afternoon OR within an hour. Well, the best thing about us is that we purchase all your old, scrap, unwanted, registered, accident, unused, or even new cars, trucks, vans, SUVs, 4wds and in some cases even bikes or boats. Selling to us is as easy and fast as 1 2 3.
and inform us of the model, make and soon our team will give you a free quote over the phone. You can also contact us online by filling up a small quote form. Once agreed, we will send our team with drivers and tow truck to your location. We will take care of all the paperwork and all our services are free. We will also inform you ways to hand over your number plate to the government authorities. We’re fast and really get the things going within minutes of our arrival. You can definitely rely on our service. Sometimes the hassle of selling your unwanted junk car is just too much, and other times, you’ve a vehicle that has absolutely no resale value. Regardless of the reasons for wanting to get rid of your car, car removal Sydney is there to help you and give you TOP DOLLAR so that you can earn full value of your junk. We won’t let the piece of junk spoil the beauty of your yard, as our team will immediately tow it away for free. Call us today at 0422 600 833 or schedule your FREE estimate online on Metro Car Removal ! Our friendly representative will check the local availability and will schedule your no-obligation quote at the time most convenient to you. Once you accept our quote, we will call you about an hour before your scheduled appointment time. Our professional, friendly and uniformed team will arrive at your place on time in clean junk removal truck. We will complete the papers, hand you over the cash and will tow your car or any other vehicle away. There are no towing charges at all! Dealing with car removal Sydney means we do all of the labor and loading no matter where your car or other unwanted junk vehicles are located. All vehicles we remove are carefully disposed of, recycled, or donated. We will even get in touch with you after the job to make sure you’re 100 % delighted with our service! Why Metro Car Removal Sydney Service? 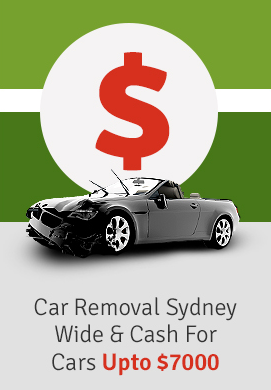 The biggest and most obvious reason to choose car removal Sydney is because we’re the oldest, most respected and professional car removal company that offers you top dollar for your unwanted car. When you call u, you will receive $7000 for your unwanted car. As we are the largest cash for cars company in Sydney, we cover most areas including Greater Western Sydney, Eastern Suburbs, Inner West, Southern Sydney, CBD and northern suburbs. We can provide our customers with top dollar for their unwanted vehicle removals. When you choose car removal Sydney service for your old car, you’re never charged any towing fee. All our removals are completely free, and we simply put the quoted cash in your pocket before we tow your used, unwanted, scrap, damaged vehicle away. We accept all makes and models like BMW, Toyota, Nissan, Benz, Mazda, Honda, Fiat, Isuzu, Audi and more. All our scrap removals in Sydney are fast and friendly and most of all completely hassle free. With us, you never have to be concerned about taking time off from your daily schedule to meet our removal specialists, as they work around the clock to ensure we are available when you are. Because we offer such a large amount for buying our customers old, damaged, junk, rusted and used vehicles, not all of them are scrap vehicles. Some of them are hard-to-sell old models, while for others owners simply have no time to sell the vehicle, and yet few others are nearly new. When we don’t resell the cars, we simply recycle them and reuse and resell parts and scrap metal. We’ve a team of largest and best scrap yards in Sydney, and some of the best auto dismantlers work with us as soon as we bring in any old and unwanted vehicle. They immediately get onto work and start stripping the vehicle of its components and parts and continue on the job until the vehicle is just a bare piece of shell. So, once all the components and parts are out, they then press and crush the vehicle and make scrap metal from its frame. The team then reuse, and resell the parts, scrap metal and components of the vehicle, which is why we’re in position to offer you best possible price on even the most useless piece of junk! For a completely free, no obligation top dollar quote worth up to $7000 on your Junk car in Sydney, just give us a call on numbers listed below, or fill up “Get a Quote” form on our website. Our team will be there as soon as this afternoon, and before they leave with your junk car, you’ll have cash in your hands!